Ok. I have to apologize about this one. I just noticed today that I have never written about an excellent open source program I have been using even before I started this blog! Whether you are a code monkey or just hate Windows notepad, Notepad++ is a great replacement to have. You can see a lot of screenshots of its various features here. Notepad++ is Windows only. I have tried to run it in Linux via Wine but it is very unstable at best. I use Komodo Edit in Linux and I will write about it in a future post. You can even carry Notepad++ in your thumb drive in portable format by getting it in a zip format. Check out more useful portable apps here. Plus, Notepad++ is extensible and there are plenty of plugins available that extend the functionality just like Firefox extensions extend Firefox’s ability. Some of my favorite Notepad++ Plugins are and you can find them under plugins here. You can find out how to install a Notepad++ plugin here. 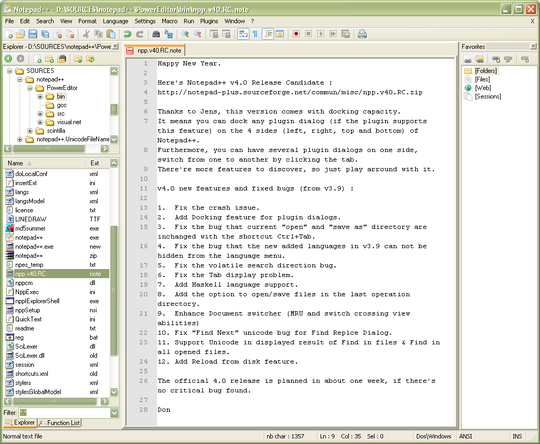 Notepad++ is included in the OpenDisc project that collects the best open source products available and make it available as a CD download. What is your favorite source code editor or notepad replacement? Just checked this download out think its going to be very useful. .-= Graham Gunningham´s last blog ..Recycled Promotional Products the green alternative =-. Hey usually i prefer dreamviewer to edit my html and css code, but these additional features might interest me i’m gonna check this now. .-= Blues´s last blog ..Blues Musicians =-. I use both Notepad++ and NaviCoder Editor. I find NaviCoder Editor interface to be more refined on the whole. Thanks for the tip, John! I will give NaviCode a whirl and see how I like it. Stef,rnrnThanks for the heads up. I will post a review of it here once I try it out.rnrnCheers and thanks for the comment. Notepad++ (or NPP) is an awesome program. You don’t have to be a coder to love it. If you are not familiar with it, think notepad with tabs and plugins. Plugins can also be added and managed from within the program itself. Just go to plugins|plugin manager in the file menu. Of course it has a lot of other awesome features, too. I think one of the coolest is the ability to run search and replace on all files in a folder, without even opening the files. I’ve used it to update over 2000 html files simultaneously before, and it did it in seconds. All this and it’s free “(as in “free speech” and also as in “free beer”).” Cheers!